The closing ceremony of the 20 Machine-Tool and Manufacturing Technologies Congress took place on 12 June 2015 last, presided by Arantxa Tapia, Minister for Economic Development and Competiveness of the Basque Government, during which three awards were presented, and the work of Justino Fernandez, professor of TECNUN-University of Navarre and regular collaborator of the congress, was recognised. The Regional Minister for Economic Development and Competitiveness, Arantxa Tapia presided the closing ceremony of the twentieth edition of the most veteran industrial congress, which has been attended this year by more than three hundred people at the Science and Technology Estate of Guipuzcoa. Arantxa Tapia was accompanied during the closing ceremony by Antxon Lopez Usoz, President of AFM, Jon Peli Uriguen, Councillor for Innovation of the Regional Council of Guipuzcoa, and Andres Zabara, Director of Promotion and Cooperation of the CDTI (Centre for Industrial Technological Development). 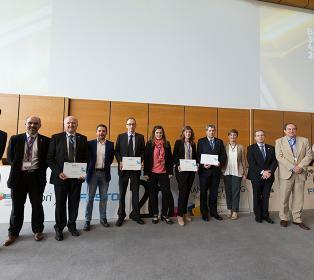 The jury agreed to grant the 2015 award to the best presentation given by the Scientific-Technical Community to the work entitled “Manufacture and repair of turbines by laser-welding on 5 axes", prepared by Amaia Calleja, Ivan Tabernero, Aitzol Lamikiz and Norberto Lopez de Lacalle from the mechanical engineering department of the University of the Basque Country. The award to the most innovative presentation was given to the company, Korta, for the presentation entitled “Quality control of ground spindles by means of the Barkhausen magnetic emission non-destructive technique”, carried out in collaboration with IK4-CEIT and TECNUN and whose authors are Kizkitza Gurruchaga, Ane Martínez de Guereñu, Aitor Lasaosa, Fernando Arizti, Ángel Guenetxea and Xabier Korta. The third award this year, the Award of the Council of Guipuzkoa, was granted to the “best final year project of a Technical School”. This award corresponded to Leire Godino, a student of the Machine-Tool class, promoted by AFM, at the Higher Technical Engineering School of Bilbao, of the UPV/EHU, for her project “Characterisation of CBN grindstones for grinding super-alloys”. Furthermore, the congress organisers wanted to give a special acknowledgement to Justino Fernandez Diaz, professor of mechanical systems of TECNUN-University of Navarre. Justino Fernando has personally collaborated in the organisation of this Congress since its 4th edition, participating in the different committees, in the prize awarding jury, and also as session chairman and speaker. From AFM we wished to thank him for his dedication, which is why the association’s silver insignia was granted to him, in recognition of his extensive and productive professional career in the teaching and research fields related to Industrial Electronic and Automatic Engineering.